The Cornelius Arts Center will name their upcoming arts center after local community leaders Bill and Ericka Cain after the couple donated $5 million dollars to the center's comprehensive campaign. Officials say Bill and Ericka Cain relocated Financial Independence Group, FIG, to Cornelius in 1998. Dr. Cain serves as Chief Executive Officer while Mrs. Cain serves as Executive Administrator. In 2017, they were both honored for their community work as Dr. Cain received the Robert T. Cashion Person of the Year Business Award, and Mrs. Cain received a Lifetime Achievement Award from Business Today. "We are thrilled to be able to be part of the arts center," says Dr. Cain. "The arts center will improve the aesthetics of the community and it will be the catalyst to bring more improvement to the area. We can't think of any reason not to support it." The couple's donation, paired with fundraising and public funding from the Town of Cornelius totals $12 million towards the center's $25 million campaign goal. 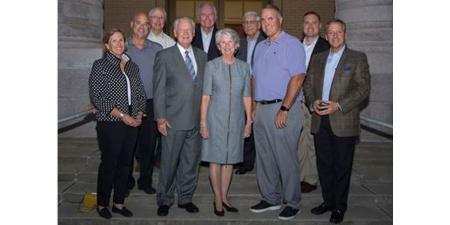 We are honored to have Bill and Ericka Cain make this legacy investment to name the facility. It not only provides a foundation for the center, but calls all of us to action in following their lead. It tells everyone that this arts center project is a reality. Officials say the new center will also anchor the revitalization and economic redevelopment of downtown Cornelius. The Cains leadership for the arts center project is going to provide so many positive effects for Cornelius and the Lake Norman Region. It's going to provide quality education, entertainment and social experiences for all ages. It's also going to create more opportunities for successful economic development projects for our downtown area. Cornelius Mayor Woody Washam Jr.